Gottlieb & Janey, LLP attorney Robert C. Gottlieb said on Friday that Craig Carton was a good man with a long history giving back to the community. "The government's allegations against Craig Carton demonstrate a gross misunderstanding of what happened. Craig is a victim who was deceived, manipulated and used by individuals seeking to gather assets for their own fraudulent schemes." "Craig is a good man, devoted to his family with a long-time personal commitment to giving back to his community." A few years ago The Blitz' own Bob introduced Craig to a business partner who was developing a new video replay system. 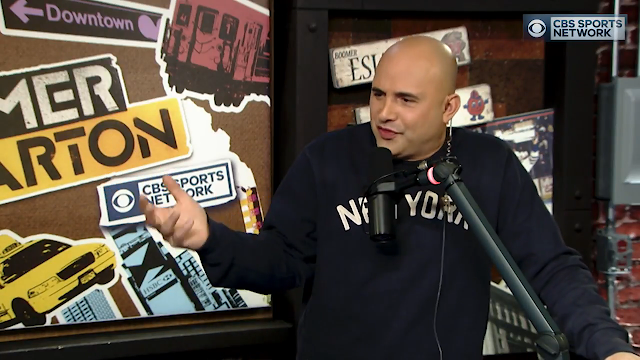 After the meeting the partner asked Craig Carton how much...what percentage he wanted in exchange for the assistance. Craig said, turning and pointing to Bob, "I don't want anything. I'll help because of him. If, a few years later, you do the great things I think you can do and you want to throw me a few bucks, so be it. And if not, that's fine too. I just hope you do well because of our new friendship." Yesterday we exposed Bruce Golding's (SPORTS EXCLUSIVE! Additional reporting by Lorena Mongelli...) piece for the NY Post Craig Carton’s ‘do-nothing’ charity raised ‘a lot of red flags’ as a lazy piece of garbage hatchet job - noting that Timothy L. Hottel, Dean of the College of Dentistry at The University of Tennessee Health Science Center reportedly received $340,000 from TicTocStop, Inc., for the 'Clinical Study on Use of Oral Appliances in Mitigating Severity, Frequency of Motor and Vocal Tics.' At the time Dr Hottel was quoted as saying, "This is the first time in medical history that a multi-site study of this type has been done," said Dr. Hottel. "We are proud to be part of this forward-thinking research initiative to determine the viability of the TicTocStop appliance. This device may have the potential to help tens of thousands of people who suffer from motor and vocal tics." We also questioned Golding's complete refusal to mention 'Camp Carton.' Gottlieb confirmed our findings: "Through TicTocStop, a foundation focused on funding Tourette Syndrome research and programs for children who have the syndrome, Craig has sponsored a $340,000 study by the University of Tennessee Dental School to develop a revolutionary new treatment for patients with mild to moderate Tourette Syndrome. Currently in review with the FDA, the appliance, called the Tic Guard, has shown an average tic reduction (both motor and vocal) of 39%. Every year the foundation also fully funds Camp Carton, a sleep-away summer camp serving children ages 9-13 years old that are suffering from Tourette's. So far 175 children have attended the camp." Carton earlier said, "We, along with several others world wide, set out to find a non Pharma solution to the tics and twitches that are the hallmark of Tourette. I am very proud to say that the near half a million dollar study into the efficacy of a patent pending mouth guard that we created to reduce tics, at The University of Tennessee Dental School, has produced very promising results. These results have given legitimacy to a non-invasive non-pharmaceutical treatment option. We are proud to provide a light at the end of the tunnel for families affected by Tourette Syndrome. The study, which we funded 100%, is under FDA review and while we keep our fingers crossed each night before we go to bed that the FDA will approve what we call The Tic Guard, our research shows it has benefits for those who use it."